Audi Athlone is to continue as title sponsor of Buccaneers Rugby Football Club for a sixth season. 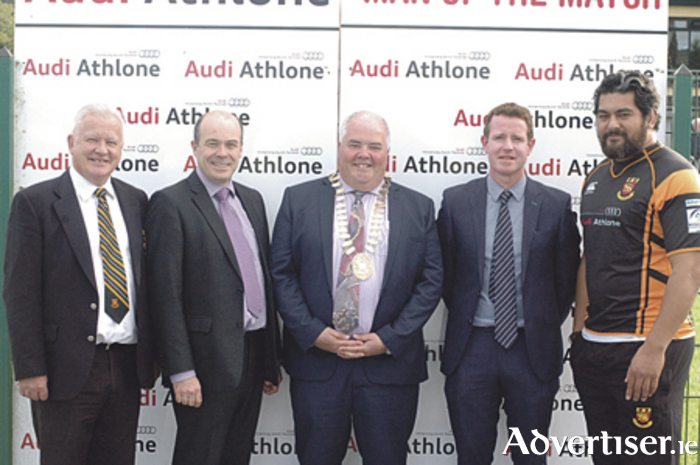 Commenting on the sponsorship, Buccaneers president, Eddie Walsh, said: “The club is extremely proud and grateful that Audi Athlone is again title sponsor for the coming season. A very exciting year beckons, with strong club ambitions. Audi is a superb and distinctive brand which, like Buccaneers, strives to be best in class. On behalf of Audi Athlone, Mr Ian Moore said: “We are delighted to again support Buccaneers and are looking forward to continue working with the club as their official sponsor for a sixth season. It is a great honour to be connected with Buccaneers. Our colleagues in Audi Ireland are also delighted to be associated with a rugby club of the calibre and prestige of Buccaneers and they see our association as mutually beneficial. Michael Moore Car Sales Ltd has operated the Audi franchise in Athlone for more than 35 years; you can view and sample the full Audi range in their new ultra-modern showroom. Their service department is housed adjacent to the showroom and is equipped to ISO standards. They also provide a comprehensive and professional after-sales service.